Through combined training a “Med-Peds” physician is both a fully trained internist (general physician for adults) and a fully trained pediatrician. This allows one physician to provide comprehensive care for the entire family from the newborn to the geriatric patient. We provide a full spectrum of health care that includes well and sick care for adults and children as well as health education, minor office surgical procedures, immunizations sports medicine, and full laboratory facilities. Left to Right K. Ruiter, FNP, Ersilia Sarno, FNP, Dr. Michael Capps, MD., Dr. David Outlaw MD., Dr. James Womble, MD. 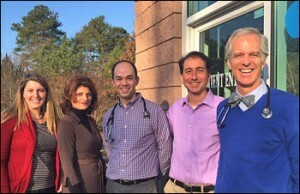 All of the physicians at Internal Medicine and Pediatrics Associates of Cary are board certified in both Internal Medicine and in Pediatrics. We are committed to providing the highest level of adult, pediatric and geriatric medical care in a comfortable, friendly setting. We look forward to caring for you and your entire family. Internal Medicine and Pediatrics Associates has been providing care for citizens of the Triangle and Cary area since 1999. We are accepting new patients and their brothers, sisters, mommies, daddies and grandparents too.